This evening on our special pre-Inspiration Dissemination interview, we had a wonderful conversation with Kelsey Kean, a PhD candidate in the department of Biochemistry & Biophysics. 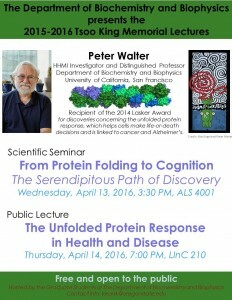 While discussing the Tsoo King Lecture series, we stumbled into a myriad of tangential topics including CRISPR/Cas9 and Peter Walter’s discovery machine. As promised, we’re including some links to more information here. Click away for some awesome reading, watching, and listening! CRISPR-Cas9, revolutionary tool for genome editing. This entry was posted in Biochemistry and Biophysics on 2016-04-10 by Steve Friedman.